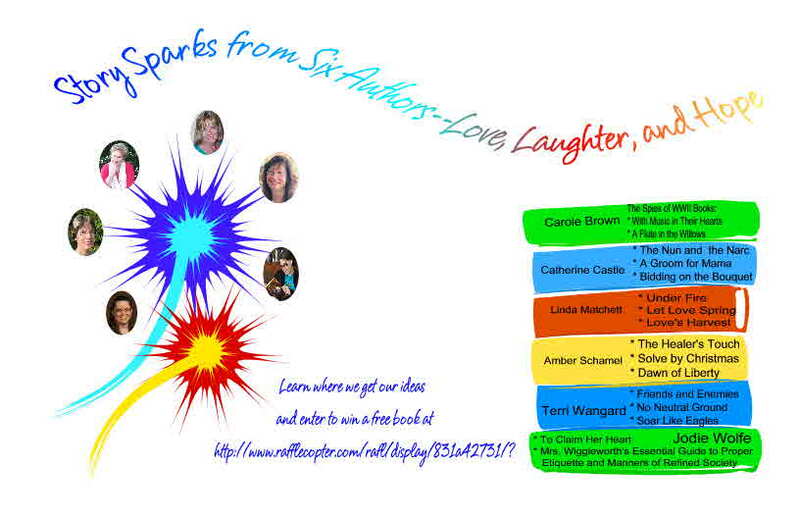 Welcome to the Story Sparks multi-Author Blog Tour. Between May 21-26, 2018 readers get a chance to enter and win ebooks from six different authors. Today Carole Brown is the featured author. 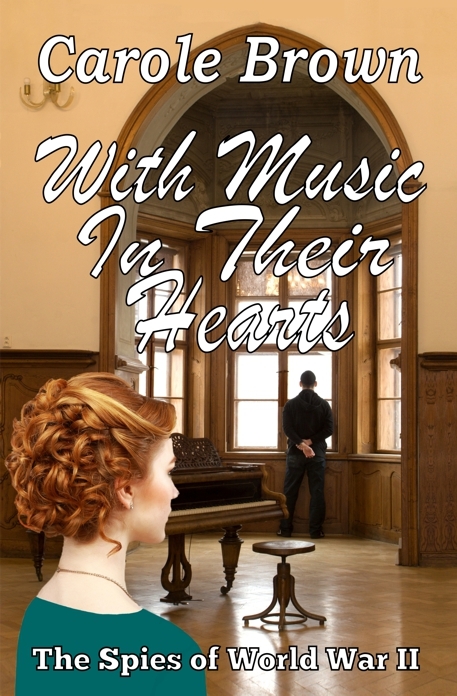 A lucky winner will get her choice of a Kindle copy of With Music in Their HeartsorA Flute in the Willows. Today Carole will be talking about these books: The Spies of WWII. Read on to discover what sparks her creativity and to enter the rafflecopter to win one of her heartwarming books. Listening to my mother talk about her life during WWII and seeing the pictures she had. A short story about a “supposed” civilian spy during WWII from an elderly man. Rumors had it that HE was that spy, but he neither confirmed nor denied it. Because my interest in WWII was sparked through these two avenues, I found it easy to fall in love with the research for the books. Researching spies was an eye-opening experience. Notonly danger is involved, but there are tons of reasons why men—and women—serve in such a capacity. The rewards are vast—money, esteem, the parties and socializing, exotic countries—if all goes as hoped and the spy escapes detection. Caught—prison and death can be the result. And since dangers and sacrifices abound in WWII stories—some of which I brought out in these books, I also wanted to create a sense of fun, warmth, and love to lighten the suspense. One way I managed to create the feeling was to bring music into the story as a subplot. The idea to include music in these books was sparked because of my own love of music. The decision as to what or how it was brought into each book was also a fairly easy decision. Music has so many benefits besides lightening up suspense books. One tidbit before I move on to the sisters. I love most instruments, but the flute was not one of them—until I heard one played by an expert. That changed my ideas about flutes, and from then on, and the idea was sparked! The flute was the perfect instrument to include in athletic Josie's life. I'd already planned to feature three red-haired sisters in their own books. It was fun to create their personalities and who the heroes would be. Fortunately, while I wrote book one, the heroes for the other two books appeared and were good matches for sisters two and three. I've always loved red hair. It's so vibrant, rich in color and alluring. Studying and researching the subject I realized how many different shades of red there are and helped spark the choice of shades for each sister to match their personalities. All in all, the first two books have been a delight to write, and I'm looking forward to the writing the third book soon. Let me share brief thoughts how the spies, music and sisters all worked together to make this series heartwarming and suspenseful. With my interest piqued and imagination soaring, I settled on the plot for book one where the hero—handsome, smart, a minister and godly—is rejected to serve overseas but recruited to serve as a civilian spy. Sparks of jealousy and love fly between him and the heroine as they battle suspicions that one or the other is not on the up and up. Emma Jaine Rayner, by her own claims, is a non-professional pianist, who entertains and gives an extra dose of homeyness to the boarding house residents with the nightly musical fests. Her active imagination while playing, increases her longing for a man to love—and Tyrell Walker, the civilian spy, increases the pressure by wooing her with his trained voice. In Book Two, the heroine and hero are both rebels in their own way. She has two loves—her skating and Jerry, her husband, an overseas U.S. spy. But when he returns home looking like a skeleton trying to return to life, she’s scared. What happened in Germany to change a man so much? When his wife's life is threatened, Jerry realizes he can’t stand by and do nothing. Jerry has to risk all for the very soul and life of himself—Josie. These two damaged, rebellious people learn the hard way that leaning on God instead of themselves and their abilities is the only true way to love and happiness. Josephine Rayner Patterson, the second sister, is quite different from her older sister. She's athletic and training for the Olympics once it's resumed after the war. But returning to her flute after a drastic alteration in her life, it's the balm that heals her troubled heart. In spite of resisting, Jerry Patterson through her music and enduring love, finds his heart strangely drawn to what he's never experienced before. The third book in this series has a tentative publishing date of 2019. The youngest sister of the WWII Spies sister overhears a private conversation while singing to the military troops and realizes it's vital information to the well-being of the United States. When she’s almost discovered, Claire barely escapes. Surrounded by zealous people she can’t and won’t trust, Claire has no options but to trust the one person she most disdains, the one person she ran from: quiet, plugging-along Wills but rumored to be the best spy serving on U.S. soil. In the midst of danger, Wills has the chance of a lifetime: to show the love of his life, his love for her. Will she learn that God is her strength and wisdom and that no matter how well she can sing, how far she travels, how many men she meets, only Wills can fill the void in her heart? Claire Roseanne Rayner is the princess of the family, the petted and beloved daughter of the Rayner Family who sings like a bird and is determined to fly away like one too. She loves God but staying away from the boy-turned-man she grew up with is never far from her mind. William (Wills) Mason has never wavered in his love for Claire Rayner. In spite of having no talent in either singing or playing, he's fully behind Claire's musical ambitions. And loving her just might bring him to the point of facing death. Jerry Patterson stared out the yawning black hole in the side of the plane. Seconds to go before he dropped. Night time parachuting was always a risky thing, but the pilot was one of the best who’d keep this baby right on target, lessening the chances he’d have to hit water. Trees were another matter, but with any kind of luck, the landing would go smooth. Then to meet his contact and move into the German military high life. His pulse revved up. It was a dangerous game he was about to play. Josie’s face flashed in his mind, and Jerry felt his heart soften. How he loved his tomboy wife. She was a beautiful butterfly dancing on ice, but put her in a social setting, and she was like a wild creature let lose in a maiden aunt’s prim parlor. Three weeks of marital bliss. It’d been heaven on earth for him. One rapturous day—and night—after another. She’d cried the night before he’d left, but had been strength personified when he’d boarded the train the next morning. If—no, when—he got home, he’d wrap his arms around her and not let her out of his sight. Jerry stepped into the hole and dropped rapidly, counting. One thousand...One thousand one...One thousand two... With a jerk he pulled, the parachute opened above him, and he drifted earthward toward his assignment. Link to the Rafflecopter Entry: http://www.rafflecopter.com/rafl/display/831a42731/? http://www.rafflecopter.com/ rafl/display/831a42731/? Does not work. The link has been repaired - please try it again. #1 I was a redhead born in 1941. #2 I played the flute all through school and especially liked orchestra. I played the flute too! Marching band was my favorite. Thanks for stopping by.